LG Dishwasher shows E1 error code, what does e1 mean? I have a 2 year old LG dishwasher. It has recently been showing the E1 error fault code. Can you tell me what this means and how do I fix it myself? Do I need to replace a part or clean an area of the dishwasher to clear the code and reset the dishwasher? Please help as the dishwasher is no longer under warranty. 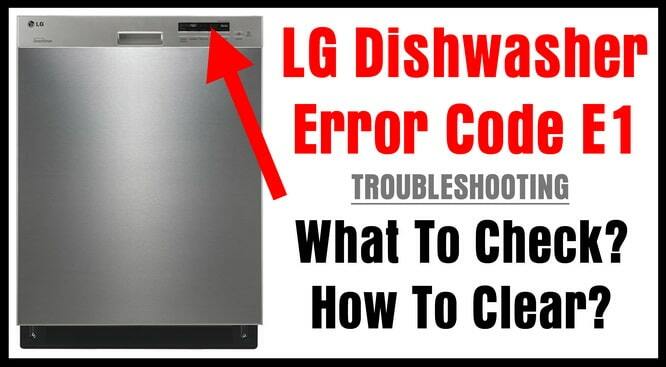 LG Dishwasher Error Code E1 – How To Clear? – How To Fix? 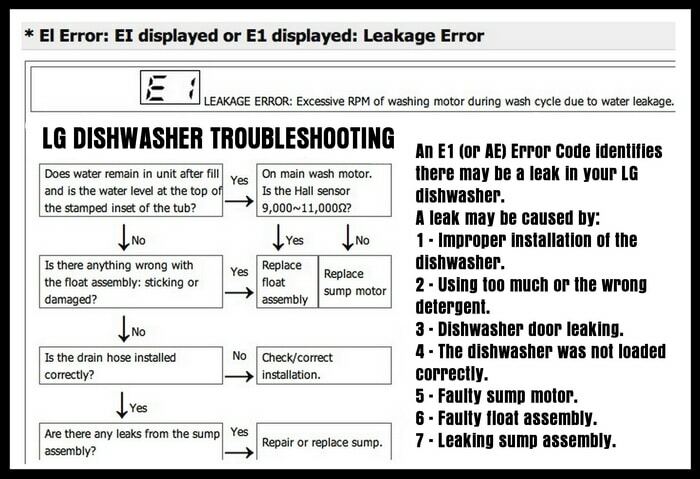 An E1 (or AE) Error Code identifies there may be a leak in your LG dishwasher. 1 – Improper installation of the dishwasher. 2 – Using too much or the wrong detergent. 3 – Dishwasher door leaking. 4 – The dishwasher was not loaded correctly. 5 – Faulty sump motor. 6 – Faulty float assembly. 7 – Leaking sump assembly. NOTE: For more detailed info on troubleshooting and replacing parts such as the Sump assembly, Float assembly, see the chart below. Drain hose outlet installed lower than the base of your dishwasher? – Drain hose outlet is installed lower than the base of your dishwasher may cause early draining. – This can be the cause of the E1 error code. – The height of the end of the drain hose must be over 10 inches from the bottom of the dishwasher. – This is to prevent water from being siphoned from the tub too early. – Check the drain hose for damage that may cause leakage. – Replace the dishwasher drain hose if it is found to be damaged or leaking water. – The wrong detergent can cause excessive suds. – If using the wrong detergent, your dishwasher can fill with suds. – If the dishwasher has excess SUDS, your dishwasher cannot wash or rinse correctly. – E1 error code will appear when there is too many suds or excessive suds. – Only use a dishwasher detergent that is made for automatic dishwashers. – Check if there is water seeping through the dishwasher door. – Check for any door seal rips or tears around the door seal. – If you find that the door seal has any type of damage, remove and replace the door seal. Are you loading your LG dishwasher with large items such as oversized pots or pans? – The way the pots and pans are positioning can cause the dishwasher to retain water that fills the dishwasher. – This can cause the dishwasher to error out and think that there is a leak. – Make sure all large pots and pans loaded inside the dishwasher are positioned in the racks correctly. – Position the large pots and pans so they do not hold any excess water. 5 – Faulty sump assembly, Float assembly. Remove and replace the sump or float assembly if you find that is the cause of the E1 error code. How To Reset An LG Dishwasher? – Turn the circuit breaker or unplug the dishwasher for 10 to 15 seconds. – Plug the dishwasher back in or turn the circuit breaker back on. – Press the power button to turn the dishwasher on. – Start a new cycle and see if that clears the error. NOTE: For proper LG Dishwasher Installation… Your LG dishwasher should be installed under your kitchen cabinet with the drain hose going through the side wall of the cabinet and then to either a disposal, air gap or just the drain line. 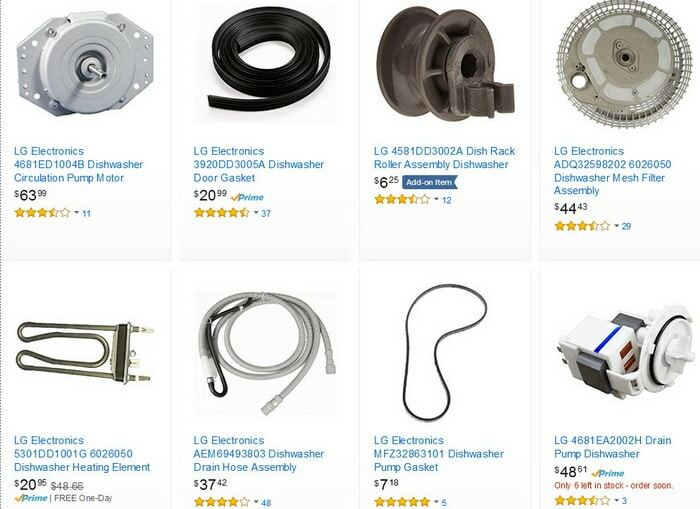 Have you tried all of the above fixes to clear your LG dishwasher of the E1 error code and it still shows the fault? Please leave your question below and we will be happy to assist you in clearing the error code. Well thank heavens I read this site. I was on my last straw with this blasted dishwasher. Needless to say, I unscrewed the mounts, pulled it out, jiggled it around, gave it a nice tap with my foot, and BOOOOYA! The code has been cleared! Took me all of 3 minutes to do this. So thank you to Chris for the idea. And try this before you call a repairman! Don’t tilt the dishwasher forward, it’s like doing something hoping for an outcome. The real fix sits with understanding the E1 code. If water leaks into the dishwasher and fills the cavity at the bottom, a float will rise and activate the E1 strip switch…. well there we Go, if there is no water in the bottom cavity the problem will still lay with the E1 trip switch. Fix – locate a polystyrene float laying on the bottom of the sump cavity, there should be a vertical plastic dial attached to the float, tape or glue a small sinker or nut to the plastic dial, gravity of the sinker will force the switch to stay closed and not leak. Had the same E1 error code. Cycled breaker many times. Filled and drained the water a few times as the drain pump ran constantly. Buggered with this and that switch / button / door. Kicked a few times. Considered calling the help line but didn’t. FINALLY read this blog. Undid the mounting screws, pulled the dishwasher out a foot or so, tilted forward, gave it a light kick just to make myself feel good, set it upright and found the E1 code cleared! Thank you Jason! I have an e1 error message on my two year old LG dishwasher. There is no obvious leak. The dish washer is empty and sighted to the left of the sink. I have switched it off at the main for a few minutes but the error message came straight back on. Is there anything else I should try? I spent 2 days dinking around turning off and on the power and getting every last drop of water from inside the washer, but had no success. My dishwasher kept getting the AE message and the pump kept trying to work. The recommendation to tilt it forward and back took 2 minutes and it worked like a charm! Thank you!! We have this same E1 error on our LG LDF7561ST. In our case our hot water is not working so I “foolishly?” decided to take note of the typical “full” level and then I drained it and restarted it, this time stopping it when it started to fill. At that point I dumped in a pot full of hot water (heated on the stove – not boiling), making sure it was still well below the typical full level and then closed the door. I assumed it would stop filling automatically – but it kept filling and filling, until suddenly this E1 error showed. After that it drained the water and all it will do now is drain and drain and drain, with E1 showing. Disabling the circuit breaker, even for 24 hours, doesn’t help. As soon as power is restored E1 shows up and it starts trying to drain constantly. Based on what I’ve read there is some sort of overfull sensor that triggers E1 (amongst other things such as a lack of drain restriction). It sounds like it is supposed to automatically reset, but in many cases it doesn’t. I just read somewhere that with some units these sensors are electronic and need to fully dry to stop triggering E1. If correct, I’m now leaving the the door left open for 24 hours, hoping the water on the sensor will evaporate and stop triggering E1. I should note that recently we’ve been having trouble with it draining. It behaves like the pump or drain valve gets plugged up with food remnants and takes numerous manual “cancel” drain attempts, cycling between drain, fill, wash, drain, fill, wash to clear it out. It appeared to be draining fine at the time of the E1 error though. I’ve been dealing with an intermittent e1 code for FOUR years. I hate this LG. I’ve had 2 repairmen out, called the foreign based customer service multiple times who always ask me about soap, pots not being placed so they hold water, etc. The last guy cleaned my float assembly, which helped for a month or two. Now the thing hardly runs a cycle without erroring out. No water leak, hoses installed correctly, good water pressure, etc. I think the float assembly is the culprit, as it will at times run a full cycle without erroring, so the sump motor is operationable. The float assembly is a horrible design and over time will get gunked up again though.. so I feel this just delays the recurrence of the problem. How much do float assemblies cost? Can I do it myself? How much headache am I thinking of going through to replace this vs how long until this float assembly gets stuck and starts erroring on me again? I had the E1 fault on our LG dishwasher. Nothing cleared it until i did what Jason further up had done. I tilted the dish washer all 4 ways and it was fixed. Drain Hoses are clear, no cloughs, unplug can’t clear or run a washing cycle. We have tried to remove the E1 code after fixing a leak in the door seal but it comes back. OK I have had the same problem clearing the E1 error code. Tilting the machine back and forth did not work the first time. I tried again this time pulling the dishwasher out further and it worked. The angle is definitely the key. We purchased our LG dishwasher about 4 years ago.. It is now showing an error code of E1, we have checked for leaks and found none. All the above test have been done but no parts have been replaced as if yet. I can’t get my LG dishwasher to clear. I have tried unplugging and when I pulled it out it reset and ran a fast cycle. When I put it back in the space, the error code came back on again. Had to replace garbage disposal that flooded kitchen cabinets. LG Dishwasher was running and was turned off, now LG dishwasher gives code 03. It sounds like it is trying to run but no water comes in and yes the water is on to washer. We rinsed the filter so it is ok.
After hours of Googling this E1 error code problem, I found Jason’s tip and it worked! Just pulled out the holding screws, slid the dishwasher out a foot, tipped it forward and backward, and the error cleared. Ran a QUICK cycle for about 1 minute with the drain hose in a plastic garbage can to see the dirty waste water come out, and success. If you have a clogged drain and water flows back into the dishwasher you’ll get this code, and this is your FIX! Thanks Jason – you saved me a lot bigger headache. Followed Jason’s and Matt’s suggestion. Pull unit out, tipped forward and backward 45 degrees and now the code has cleared. LG wanted $370 to come out to fix it. Yes! Thanks so much for your help! Our garbage disposal has been on the fritz recently and had blocked up, that caused the E1 error on our dishwasher also. We cleaned the mesh and drain cup thing, and then sucked out all the water from the hose using a shop vac. After that the E1 error still wouldn’t clear. We pulled out the unit, tried tilting back and forth a couple of times and it totally worked!! Thank you so much!!! I have unplugged The unit overnight and turn the power back on immediately it says E1 I don’t even have to turn the power button on it has an audible tone to it and flashing all the lights on the front of the unit. The unit was running at the time we lost power in the house and when the power came back on that error code was present. The dishwasher pumped all of the water out of it into the sink via the garbage disposal my son forgot to run the garbage disposal all with stuff in it so all the water wasn’t draining so it filled the sink up. So I think what happened was water siphoned from the sink back into the dishwasher . That’s probably why it got the E1 code now I check the hoses I took the pump apart there was nothing clogging or leaking the pump works it drains continually runs it will not turn off unless I can shut the breaker off. If I pour water into the unit with a tub of pumps the water out like it’s supposed to but it doesn’t stop pumping it stuck in a mode. I have exact same problem. Did you find an answer? I have the same problem as well, any luck? I’ve had this LG dishwasher for 3.5 years and never had a problem. Now it keeps giving me an error code AE which is water leakage. I have checked absolutely everywhere and do not have any water leakage. I just don’t know what else to do. I have same issue and cannot reset dishwasher. It just stays on and will not shut off even after turning off electricity and turning it back on. Previous post: Refrigerator Has Odor Inside – Does My Fridge Have A Dirty Air Filter? Next post: Washing Machine Is Spinning But Clothes Are Still Soaking Wet – What To Check To Fix?